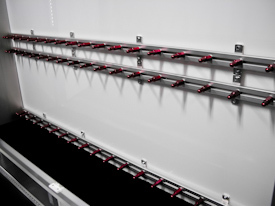 Learn More About T&E Semi Trailers! T&E Auto Haulers has the capability and experience to produce custom trailers configured for export to our motorsports friends in Australia. 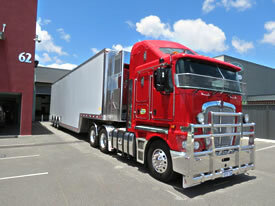 In fact, we've produced a good number of custom trailers with Australian specs over the past decade. 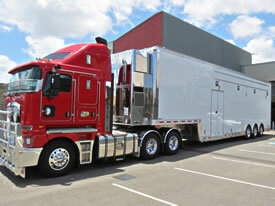 Our full line of trailers can be manufactured to Australian specifications. These trailers feature the same Performance, Dependability and Quality Construction that our regular line of trailers possess, but are configured to meet or exceed the unique requirements of your country. 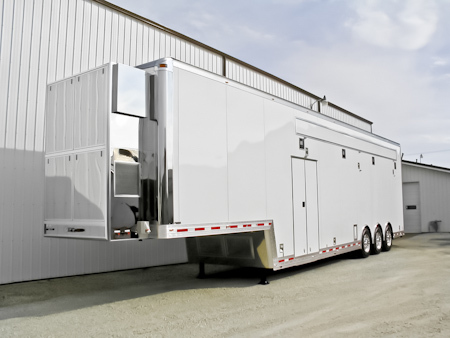 Every T&E trailer is custom manufactured to meet each owners unique requirements. 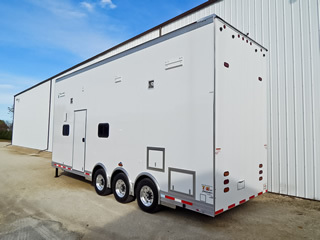 We can custom build your trailer to transport just about any motorsports vehicle that you might have. We also offer lounge options ranging from basic to advanced configurations with a variety of different layouts. Sleeping quarters, kitchen areas or meeting areas are also available as extra cost options. Most likely anything that you can dream up our talented workforce can forge into reality! 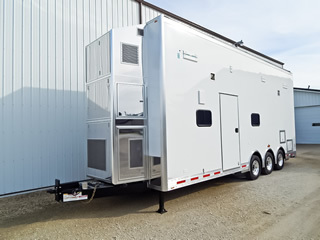 We manufacture each of our trailers paying close attention to strict quality control requirements and keep the customer involved throughout the entire building process. 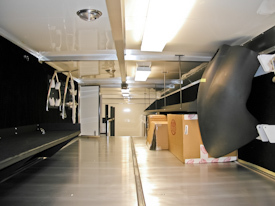 As a result, all of our trailers pull like a dream and are built for the “long haul”. You’ll also get top resale value when it comes time to sell too! Why not give us a call today at 815-426-2761 for a no pressure quote on a trailer to fit YOUR operation? If you’d like to learn more about what we have by using an online format, please use our online contact form to express your needs - we'd love to talk informally with you. 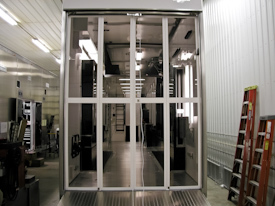 Note: T&E offers a wide variety of entry and ramp door options for trailers with air conditioning installed. Pictured above is a special custom made full height bi-fold door with clear plexi-glas panels mounted at the rear ramp door of a trailer. We also offer strip curtains as well as sliding or swinging glass door options. 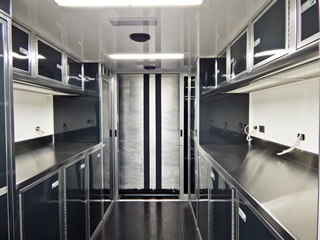 Note: T&E offers optional attic trolley systems in our sprint car trailers. These systems allow you to load and unload any heavy or bulky attic items safely to ground level. We also offer ceiling mounted wing hangers and wall mounted storage trays to help you make the most out of available attic space. A wide range of tie down track syles is also available. 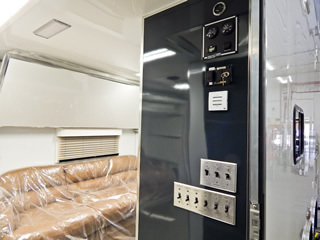 T&E can also upgrade your current trailer with custom work area cabinets, awnings ramps and much more. We are also a full service facility capable of a wide range of trailer repairs and maintenance. Please contact us for a no obligation quote. 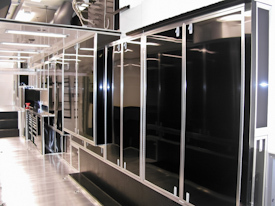 Click here to read more information about our service and repair capabilities.